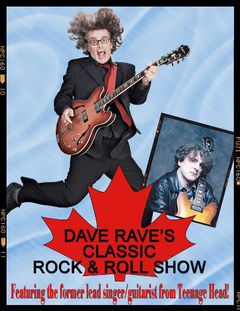 The Dave Rave Classic Rock & Roll Show is a spectacular, classic rockin’ show with a unique “Canadian” twist! This exciting four-piece showband features the one-and-only Dave Rave, the former lead-singer & guitarist from 1980’s Canadian party-rock icons Teenage Head performing a diverse range of hit songs from the 1950’s, 1960’s, 1970’s and 1980’s. In addition to song favorites from The Beatles, The Rolling Stones, Creedence Clearwater Revival, Chuck Berry, Buddy Holly, The Everly Brothers and more, The Dave Rave Classic Rock & Roll Show features well-known Canadian classic-rock radio favorites from Dave’s former band Teenage Head including the Top Ten hits “Let’s Shake”, “Let’s Go To Hawaii” “Some Kinda Fun” and “Something On My Mind” amongst other fun tunes. The group presents a truly audience interactive show highlighted by an energetic stage presentation and dynamic vocal harmonies. The Dave Rave Classic Rock & Roll Show provides a winning combination of great music, a great band and a legendary Canadian classic-rock performer making it an excellent marketing opportunity for festivals, fairs, slots/casinos, dances and special events!